In Good Shape. EX-L trim. FUEL EFFICIENT 31 MPG Hwy/21 MPG City! 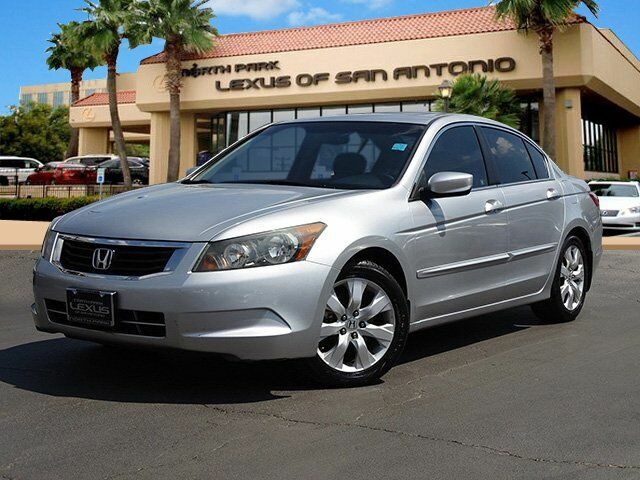 Heated Leather Seats, Sunroof, Multi-CD Changer, Dual Zone A/C, iPod/MP3 Input, Alloy Wheels, Premium Sound System, Satellite Radio. CLICK NOW! Leather Seats, Sunroof, Heated Driver Seat, Premium Sound System, Satellite Radio, iPod/MP3 Input, Multi-CD Changer, Aluminum Wheels, Dual Zone A/C, Heated Seats, Heated Leather Seats. MP3 Player, Keyless Entry, Remote Trunk Release, Steering Wheel Controls, Child Safety Locks. Honda EX-L with Alabaster Silver Metallic exterior and Black interior features a 4 Cylinder Engine with 190 HP at 7000 RPM*. Clean CarFax! Great color! Local Trade-in! 5 Star Driver Front Crash Rating. 5 Star Driver Side Crash Rating. 5 Star Passenger Front Crash Rating. Electronic Stability Control, Brake Assist, 4-Wheel ABS, Tire Pressure Monitoring System, 4-Wheel Disc Brakes Great Gas Mileage: 31 MPG Hwy. newCarTestDrive.com explains "The Accord is big on efficiency, getting the most power and range from a gallon of gas with the least emissions. ".